Each issues covers important MPA and legislative news, book reviews, substantive articles in line with the issue’s theme, and classified ads. The InPSYder is MPA’s e-newsletter sent to members monthly, in the last week of each month. 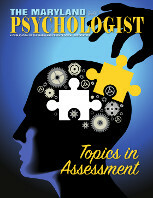 It contains timely news updates, member opportunities, and handy tips and resources for psychologists. The InPSYder is archived in the members section. Advertising is available.